Mr Mazumdar served as WCF Chair from1997-2005 and was a champion of entrepreneurship and a firm believer in the benefits of working globally. Mr Mazumdar began his career in 1944 as a dealer for the American construction equipment giant Caterpillar, working also with the oil exploration industry in the US and India from 1956 to 1960. He joined TIL Limited in 1960 as a management trainee and sales engineer, and rose through the ranks to become its Managing Director in 1976. In the mid-1980s, he acquired a controlling stake in the company, which was Caterpillar’s sole distributor in eastern India and Nepal, Sikkim, Bhutan and Myanmar, and became its Chairman in 1985, and then Chairman Emeritus. TIL is engaged in manufacture and/or sales and service of earthmoving, construction, mining, material handling, and power generation equipment. The Company has close association with Caterpillar Inc. US and Manitowoc Crane Group US. Mr Mazumdar served as a president of some of India’s leading chambers of commerce. He served as a president of the Associated Chambers of Commerce & Industry of India – Assocham – (1990-91), the Indo-American Chamber of Commerce (1982-83) and the Kolkata-based Bengal Chamber of Commerce and Industry. 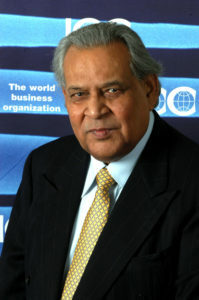 On the world stage, Mr Mazumdar served as Vice Chair of the World Chambers Federation, then known as the International Bureau of Chambers of Commerce (IBCC) from 1993-1996, alongside Adnan Kassar. He became Chair in 1997 serving until 2005. In this role Mr Mazumdar steered the transformation of the IBCC into the World Chambers Federation in 2000, and heralding the introduction of some of the key activities of the Federation including the World Chambers Congress and its World Chambers Competition. He also led the introduction of WCF’s Certificate of Origin services that have gone from strength to strength over the past decade. Mr Mazumdar was also a former president of ICC India and Past Executive Board of the International Chamber of Commerce, the world business organization. He was a member of the Board of Governors of the Indian Institute of Management Calcutta and also of the Court of Governors of the Administrative Staff College of India.